300 years ago, Daniel Defoe's famous novel, Robinson Crusoe was published. Defoe's inspiration was said to have come from the travels of Alexander Selkirk: the Scottish Privateer who was famous at the time for having survived and returned to Britain from an remote uninhabited Pacific island. Selkirk’s island is now part of Chile, and in 1966, it was renamed Isla Robinson Crusoe. Roger Palmer's new exhibition, REFUGIO at Kirkcaldy Galleries, explores the blurring of fact with fiction between Selkirk and Crusoe. 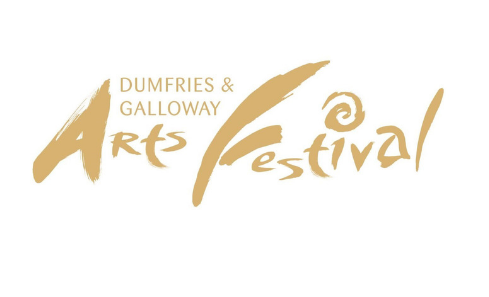 We spoke to Fife Contemporary's Diana Sykes to find out more. Why did you choose to programme this exhibition? I have long admired Roger Palmer’s subtle, and at times, unsettling work and was therefore very receptive when he suggested an exhibition concept which had a strong local relevance. It is great to bring such an ambitious project, involving an expedition to an island off Chile, to Fife. Also, Kirkcaldy Galleries encompasses a library as well as a museum so the exhibition’s theme brings together these different aspects of the venue. In what ways does this exhibition explore the blurring of fact and fiction? The title refers to both Robinson Crusoe and the man he is reputed to be based on, Alexander Selkirk. Daniel Defoe supposedly modelled the hero of his seminal novel on the Scottish Privateer who was famous at the time for having survived and returned to Britain from an remote uninhabited Pacific island. From this inspiration, Defoe created his own character with a different life story and a key additional character, Man Friday. However, Selkirk and Crusoe get conflated and confused with the real man Selkirk’s identity subsumed by the now more famous fictional Crusoe. For example, in Selkirk’s birthplace his statue is often believed by visitors to be of Crusoe and the local hotel is named the Robinson Crusoe. How does this exhibition engage with literature? The exhibition is being held to coincide with the 300th anniversary of the publication of Robinson Crusoe in April 1719. It reflects on the relationship between this internationally famous early novel and the source of its inspiration in Fife. Such is the significance of the book that it has provoked many retellings and responses over the long period since its creation. In the 21st century, we approach it with a different perspective to that of its contemporary readers. Roger Palmer includes quotes in the exhibition from South African writer JM Coetzee’s 1987 novel Foe, which provides a complex alternative version of Defoe’s story engaging with issues of race present in the original. Why does this exhibition feature mixed media? Artists often collect something because it has a certain resonance for them and this may lead to the development of an artwork, or it may not. Roger Palmer found an old German children’s edition of Robinson Crusoe in a second hand bookshop in South Africa and he was drawn to the illustrations. This provided the seed for what eventually developed into his photographically-based project. 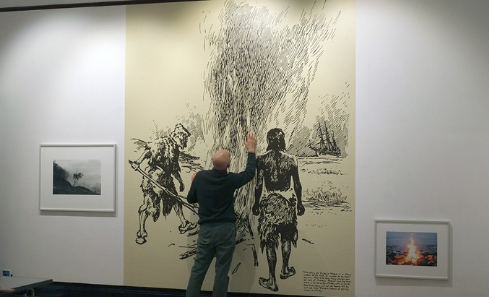 Life-size enlarged versions of the illustrations are therefore interspersed with the photographs (which contain no people although they do include signs of human life) to introduce the Selkirk/Crusoe protagonist and create a sense of narrative in each gallery. We are drawn into the story/ies. The book and a map of the island further involve us. Roger Palmer has been developing this kind of mixed media installation over the last few years. How do the works engage with the local area? The birthplace of Alexander Selkirk is few miles from Kirkcaldy in Lower Largo. Amazingly it is twinned with the island several thousand miles away on which Selkirk was marooned. 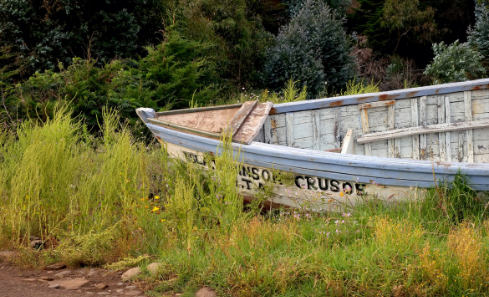 In another example of how his memory is dominated by his fictional alter ego, this island off Chile was renamed Isla Robinson Crusoe in 1966 – although in the novel Crusoe is shipwrecked off a different coast! Following his photographing of Largo Bay, Roger Palmer made an adventurous trip to Isla Robinson Crusoe to make images of a very different landscape and way of life. What would you like the audience to take away? We hope that both a local audience and visitors from further afield will join us in celebrating a notable anniversary and be enriched by their visit. Time spent engaging with the interwoven ideas Roger Palmer presents will give the opportunity to think afresh about Robinson Crusoe and how the story relates to our contemporary experience through the artist’s eyes. REFUGIO is at Kirkcaldy Galleries, War Memorial Gardens, until Sun 23 June. See fcac.co.uk/event/roger-palmer-refugio-after-selkirk-after-crusoe/ for more details. Images: Refugio, San Juan Bautista (detail), inkjet print (courtesy of Fife Contemporary); Refugio work-in-progress (courtesy of Fife Contemporary); El Palillo, San Juan Bautista, IRC, inkjet print (courtesy of Fife Contemporary).